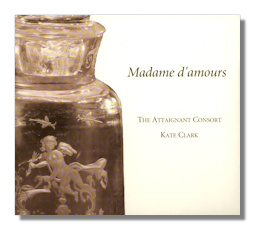 Madame d'amours is an enchanting and pleasingly varied collection of pieces performed for flute consort by The Attaignant Consort. The Consort was founded in 1998 by four graduates (from Australia, France, the Netherlands and Italy) of the Royal Conservatorium in The Hague. Having studied historical flute performance practice under Barthold Kuijken and/or Wilbert Hazelzet, these experts (they also work with such renowned groups as Les Musiciens du Louvre, Freiburger Barockorchester and Musica Antiqua Köln – amongst others) also pursue their passion for the sound world of the Renaissance flute in collaboration with Italian flute maker, Giovanni Tardino. The premise of all concerned is that such consort music aspired to a closeness to the patterns and intonations of the human voice. This was (and is, here) achieved by careful attention to instrumental articulation, expressiveness and dynamic shading. The Attaignant Consort likes to play with facsimiles of the original parts in preference to scores; and from memory whenever possible. For this recording the Consort is joined by harpist Marta Graziolino, lutanist Nigel North and flautist Mathieu Langlois. Thus this lovely CD is as much about the sounds that can be evoked and achieved by such accomplished experts as it is about the repertoire: many of the works are available in other collections… those by Josquin, Dowland, Isaac, Victoria, Gombert, Fayrfax, Obrecht, Lassus and their contemporaries are pretty familiar to lovers of the standard "early" music repertoire, and beyond. But that's not the point. One listens to this interesting and ultimately very worthwhile CD for insights into the musicology behind the original performance of these pieces (none is longer than four and a half minutes or so). Of course the issues of musicology are ones of sound; approaches to sound are bound with decisions regarding interpretation; and such decisions must be based on the music itself. So to sit in – as it were – on the act, not of recreating, nor particularly reworking, the music – but of reaching the essence of these works is a very satisfying experience. For there is a gentleness as well as a compelling assuredness in the playing throughout the CD. The attitude of the Consort to the music is akin to that of a parent of a gifted child anxious to commend its virtues, aware of the need not to exaggerate them; and at the same time confident that the child can hold its own when asked to recite, paint or run. In other words they do let the music tell its own tales. And by stripping away too much past embellishment, The Attaignant Consort lets the music's light, rather than its reflection, illuminate our understanding of it &ndasd; and of their approach to it as contemporary musicians. Examples of perfunctory plowing through the consort repertoire (for novelty value; to showcase an artist; to attempt curious groupings and so on) are all too common. Madame D'amours is exactly the opposite. It's a delicate, subtle, highly nuanced recital that really does show the strengths and beauty of the sounds which the flute consort can make – but through the music itself. Most of the works here were originally conceived for the voice, although there are pieces (La my, Carmen, Jägerhorn) which were purely instrumental. Others use the flute as an accompaniment, almost, to the harp or lute. Other ways of presenting melodies ('divisions", "diminutions' and indeed solos for lute and harp) are explored. They all contribute to the notion that, just as the sonnet epitomized humanist poetic invention in the Renaissance, so the consort perfectly emulated and embodied the fundamental beauties of the human voice. In that sense, it was necessary for the instruments to respect its registers and ranges. Hence flutes of different sizes. Hence too The Consort's emphasis on delicacy; humor; a liberating approach to rhythmical patterns without being wayward; to achieving a balance between the beauty of quite breathy sounds, and the need to keep the tempi consistent with the spirit of each piece as much as with any predetermined formula. Quite magical in places. It was also the popularity of the chanson (polyphonic setting of French verse) from the sixteenth century that afforded this music such appeal. The Attaignant Consort builds on the claim that, although we know all too little about Renaissance performance practice, such repertoire seems particularly well suited to the flute. Indeed The Consort (Kate Clark, Frédérique Chauvet, Marion Moonen, and Marcello Gatti) takes its name from the publisher, Pierre Attaignant, who did so much to promote such a happy marriage in the first half of the century between words and music. But this is not a "demonstration" CD in any way; nor one where abstruse academic thrust takes over from the pleasure to be had from the music itself. As is made plain in the excellent essays by Clark herself which form part of the booklet in the CD's "digipak", nothing but good can come from a thorough understanding of the musical and social context in which these pieces were written. The booklet, interestingly, also contains the texts of the original songs. Here, then, is a beautifully crafted, meticulously researched, generously presented and impeccably contextualized collection of attractive music – wonderfully played. It starts with an honest and intriguing premise, follows it through and arrives at a whole that will repay repeated listening. Recommended.